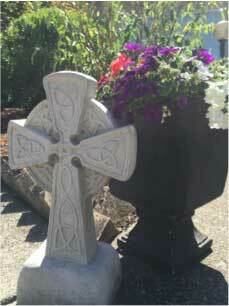 A celtic cross stands in O'Hara School's courtyard. EUGENE — At the heart of O’Hara Catholic School here is a large courtyard designed and landscaped by the St. Francis Catholic High School class of 1965. Through the years, the landscaping had become overgrown and in need of attention. This summer, a former student and donor families transformed part of the courtyard as the first phase of a renewal project. Three large conifers that had grown too large and too near the building were removed, old stumps were removed, and the ground was leveled out so that picnic tables can be added. The space will now be easily accessible and functional for teachers to use for outdoor classes. A large portion of the excavating work was done by Nick Armbrust, a 2015 O’Hara graduate who is working toward his Eagle Scout badge. New shrubs and trees have been added into the landscape design. They flower in the spring, adding beauty especially for the May crowning and Living Rosary held at O’Hara every May. Once the landscaping is complete, O’Hara has three new large statues that will be placed into the courtyard. The new statues include Our Lady of Lourdes, The Holy Family and Our Lady of Fatima.